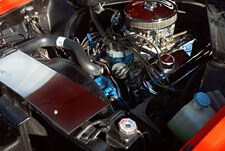 Edlebrock 4 BB Carb & High Performance intake. Front disc brakes with new brake lines & gas lines. Great Pioneer CD with new Kenwood 3 way speakers, 3 year old paint, very clean Interior & engine bay! *Comes with extra set of like new tires & Chrome wheels. Orig. 302 V8 rebuilt recently, runs strong! Great value for the last year of the great classic Mustang!